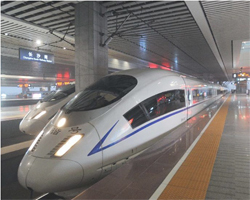 Near the great wall of China to build a deep station for high speed trains | All about CHINA. In the near future in China near the great wall of China build the deepest in the country station for high speed trains. It will be this construction in the suburban area of Beijing. Shared the news Agency China Daily. According to the newspaper, the station will be built at an accelerated pace and in 2019 it will come into operation. The venue is chosen, the next piece of the great wall in the Badaling area. The station will be on the road on the way from Beijing to Zhangjiakou. This direction is heavily loaded in the company of the future Olympic games in 2022, it will be held in Beijing and the surrounding areas Station speed post will be at the depth of 102 meters, it will be a very Grand structure, the total area of the halls and 35 thousand square meters, it will be the deepest and largest Alpine station for high-speed communication, in the World or anything like that at this time there. The station will be built in three tiers, one tier will be arriving train, and the other layer will go away. Between stations is a distance of 62 meters, which can quickly be overcome by high-speed escalator. On the way from Beijing to Zhangjiakou train will stop 10 times. The construction of a huge scale, it should be completed in almost 4 years. Chinese builders implement the most modern technology, harm to the environment without causing. Will be in Beijing as the summer Olympic games, and winter, in 2008 China hosted the Olympics, all work items will result in the order and in addition will build the new one. Due to the fact that Beijing is often a strong smoke air, many competitions will be held in Zhangjiakou.